Nanotechnology and art combine to create some mind-blowing projects. But these projects are not simple to develop; they require a great deal of patience and complex interpretations. Many of these interpretations have to be very abstract considering that nothing is visible by the human eye when dealing with nanotechnology. As described in the reading, “The Nanomeme Syndrome: Blurring of fact & fiction in the construction of a new science”, much of the imagery created is dependent upon a narrative describing what is sensed but not seen. This is where the title of the article comes from, because often times the narrative is inspired purely from science fiction. The authors, Gimzewski and Vesna, describe this reliance on science fiction as “a shift in our perception of reality to from a purely visual culture to one based on sending and connectivity”. Cris Orfescu is an example of an artist who dabbles in “nanoart”. He runs the laboratory at Caleb Technology and works to design lithium batteries. However, in his free time, his training in materials science allows him to create nanoart masterpieces. 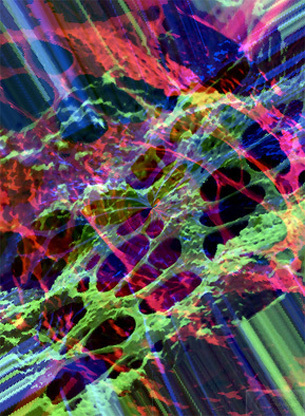 These art pieces take devices such as scanning electron microscopes to create nanoscale images. 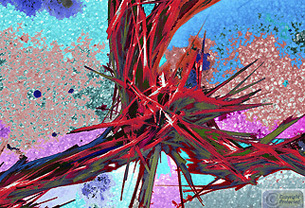 Orfescu’s art features nanolandscapes and nanoscultpures and must be converted through unique artistic techniques in order to be showcased for his audience. This new form of art is yet another magnificent example of art-science-technology intersections. "Cris Orfescu." Cris Orfescu. EMarketing 21, 2016. Web. 22 May 2016. Dr. Gimzewski. " Nanotech for Artists Part 1." YouTube. YouTube, 21 Apr. 2012. Web. 13 May. Dr. Gimzewski. " Nanotech for Artists Part 2." YouTube. YouTube, 21 Apr. 2012. Web. 13 May. Feder, Barnaby F. "The Art of Nanotech." Bits The Art of Nanotech Comments. The New York Times, 25 Jan. 2008. Web. 22 May 2016. Lilley, Maiken. "The Art of Nanotech." PBS. PBS, 18 Nov. 2010. Web. 22 May 2016. Cris Orfescu's work is really cool! They are visually stimulating and contextually interesting. I am curious as to how much of his work is based on the actual electrons and how much is based on creativity/ imagination. I am hoping there is some level of accuracy to his work because it is really interesting and we can learn a lot about how elections work from it.